The belief that technology can always overcome natural limits just took a big hit this week when Royal Dutch Shell PLC decided to shut down its pilot oil shale project in western Colorado after 31 years of experimentation. The ostensible reason is that the company has opportunities elsewhere. Shell says it wants to shift resources away from the intransigent rock and move it to profitable opportunities. That sounds logical. But, it might have sounded logical in any of the last 10 years as oil prices rose to historic heights while oil shale projects languished. Even today the average daily price of crude oil hovers near its historic highs set in 2011 and again in 2012. The prize for anyone who profitably unlocks these deposits is huge, an estimated 800 billion barrels of recoverable resources. So why isn't oil shale yielding to the mighty combination of deep pockets, sophisticated technology and high prices? A clue comes from one sentence in coverage in The Denver Post: "Full-scale production would probably have required building a dedicated power plant." In simple terms, it takes energy to get energy. Shell's process requires copious amounts of electricity to heat the rock in place through boreholes in order to release the waxy hydrocarbons embedded in it. In this pilot project, the subterranean rock was heated for three years before liquids were captured and brought to the surface for further processing. The ratio of energy outputs to inputs for oil shale is estimated to be about 2 to 1, according to a study by Cleveland Cutler who has long examined energy return on energy invested. Shell claimed a ratio of around 3 to 1 (though that claim no longer appears on the project site). That seems good until you realize that we are currently running the world on crude which has a ratio around 20 to 1. Furthermore, the need for water to cool power plants associated with oil shale extraction and for processing the extracted liquids is considerable. And, water is increasingly difficult to secure in an area that has seen growing demand combined with more than a decade of drought. Proponents of oil shale claimed in 1981 that it would be economical to process if oil were to reach $38 per barrel and stay there. The threshold price kept escalating along with the price of oil all the way up to $80 in a 2008 study by the U.S. Bureau of Land Management. And, yet here we are. Brent Crude, the de facto world benchmark, hovers around $108 dollars. The average daily price for the past three years has remained above $100. In the face of these consistent record high prices, Shell is abandoning oil shale development. And, Shell isn't the only one. Another international major, Chevron Corp., pulled out of its project last year. There are others who soldier on in the oil shale deposits, and they may eventually find ways to produce a synthetic crude from this rock at a profit. But 30 years of failure suggests that such a development remains far off. And, in a world that is trying to wean itself from fossil fuels because of climate change and the risks of depletion, time may run out. The path of oil shale is reminiscent of atomic fusion research. Twenty-five years ago, fusion was supposed to be just 25 years in the future. Earlier in the same decade, oil shale was touted as the future of oil. Today, fusion remains the energy source of the future (just as oil shale does), and researchers at the world's main fusion research facility, the International Thermonuclear Experimental Reactor (ITER), say that fusion will perhaps be ready for commercial use by mid-century. To be fair, the challenges for fusion researchers are daunting. For example, they must build and run a device that operates at interior temperatures of 150 million degrees centigrade--which is 10 times hotter than the core of the sun. And, they must do it safely and in a way that produces more energy than the device consumes. But, because the challenges are so daunting, it may turn out that fusion will always remain the energy of the future. We already know how to fuse two atoms. And, we know how to process oil shale to produce synthetic oil. But, we don't know how to do either of these things at an energy or financial profit sufficient enough to make them practical for widespread deployment. There is a strong possibility that we may not learn how to succeed with either in a time frame that matters to anyone living today. That means we must get on with other technologies, energy projects and energy policies that have a more realistic possibility of addressing our energy needs and the climate change caused by our current energy regime. American political conservatives like to say that their strategy of tax cuts all the time is designed to "starve the beast." The "beast," of course, refers to government, and "starving" it means reducing its revenues through tax cuts in order to spur corresponding cuts in spending. They liken their strategy to reining in a profligate child by reducing his or her allowance. Whatever one believes about the efficacy of this strategy, it is now being employed in surprising ways in a new field by unexpected people. The brilliant symbolism of opposing the Keystone XL pipeline is intended to highlight the need to address the causes of climate change by reducing our use of carbon-based fuels. The reasoning in this case is that stopping the pipeline would prevent the increased exploitation of what opponents call the "carbon bomb" of the Alberta tar sands. Stopping the Keystone XL would supposedly prevent the companies controlling the tar sands from having access to oil markets. In effect, activists are trying to starve the fossil-fuel-consuming beast that is the global economy. If this is the goal, then this strategy must be labeled an instant failure. The tar sands oil companies are already exploring alternate routes for shipping synthetic crude derived from tar sands via other proposed pipelines. One such pipeline, Energy East, would move oil from western Canada to eastern Canada, finally ending the bizarre situation in which Canada, one of the world's largest oil exporters, must import close to 40 percent of its oil needs. The country currently lacks sufficient pipeline capacity to bring oil from western Canada where it's found to eastern Canada where it's mostly consumed. These developments take nothing away from what has been a very successful strategy by climate change activists to rally people behind fighting against something concrete as a way of advancing political awareness and action on climate policy. But this does point up a problem with attempts to reduce fossil fuel consumption by organizing people to oppose specific distribution projects. Attempts in my own newly adopted home of Oregon to stop the construction of coal export terminals are understandable given the foreseeable problems of such terminals. The transport of coal through the area is not without environmental consequences. And, having visited friends who live near train tracks on the upper Mississippi River, a key conduit for coal trains, it is no picnic to have scores of such trains passing through town each week. They back up traffic and shake nearby homes at their very foundations each time they pass. But once again, if these coal export terminals aren't built, coal producers will find other ways to transport their coal to market. The only case in which production might be reined in by such tactics is natural gas. Natural gas cannot be easily transported by means other than pipeline. It cannot, for instance, be loaded on trucks or trains economically. To send natural gas overseas by ship, it must first be turned into liquid form and then transferred to pressurized tanks on specially outfitted carriers. Activists in the United States who have opposed these liquefied natural gas export facilities are losing the battle as the federal government continues to approve new facilities, believing (wrongly) that U.S. production of natural gas is in a long-term upswing. Just as the "starve the beast" strategy has failed to bring down government spending--politicians have found out that they actually have to vote for cuts in specific programs to do that--so, too, the strategy to reduce production of fossil fuels by stopping the construction of specific distribution facilities is bound to fail. If reducing consumption of fossil fuels is the goal, what we actually need to do is strike at demand. The simplest and most effective way to do this is to levy high and rising taxes on fossil-fuel-based energy. The Europeans have done this for a long time, and their per capita energy consumption is half that of Americans. Those who advocate market-based approaches to constructing our energy future ought to be clamoring for a high and rising carbon tax. Such a tax doesn't tell industry or individuals specifically how to move from carbon-based fuels to something else. It just tells them that they need to. As such, it would be one of the most effective measures we could take to spur innovation in energy efficiency and renewable energy production. Stopping dirty coal export facilities or tar sands pipelines is actually a much easier sell than getting people to embrace voluntarily much higher energy prices (even if the rise occurs gradually as energy taxes are increased incrementally each year). And yet, such a strategy would go far in eliminating the incentive to build the very facilities which protesters are currently trying to stop. Logic is on the side of higher energy taxes. But can logic prevail when we are so fearful as a society of a future without fossil fuels that we won't implement the one simple measure that would speed the inevitable energy transition--and thereby avert a climate change or energy supply catastrophe that would force our hand anyway? Albert Bartlett might have been another obscure physics professor had he not put together a now famous lecture entitled "Arithmetic, Population and Energy" in 1969. The lecture, available broadly on the internet, begins with the line: "The greatest shortcoming of the human race is our inability to understand the exponential function." The logic is surprisingly simple and irrefutable. Exponential growth, which is simply consistent growth at some percentage rate each year (or other time period), cannot proceed indefinitely within a finite system, for example, planet Earth. The fact that human populations continue to grow or that the extraction of energy and other natural resources continues to climb does not in any way refute this statement. It simply means that the absolute limits have not yet been reached. Bartlett, who died this month at age 90, gave his lecture all over the world 1,742 times or on average once every 8.5 days for 36 years to audiences ranging from junior high students to seasoned professionals in many fields. His ability to stay on message for so long about something so important should make him the envy of every modern communications professional. In his lecture Bartlett relates that in his hometown of Boulder, Colorado, city council members once stated publicly their preferences for population growth rates ranging from 1 percent to 5 percent per year. In the course of 70 years, roughly one lifetime, the 5 percent rate would make Boulder's population (about 100,000) some 32 times larger or about 3.2 million, which would make it the third largest city in the country behind Los Angeles and in front of Chicago. A city that size could not possibly fit in the valley now home to Boulder, Bartlett explains. Attempting to do so would inevitably eliminate all open space, something highly prized by Boulder residents. Has Bartlett made a dent in our habitual ways of thinking about growth? Maybe. There were others back when Bartlett started giving his lecture who asked the same questions in a different form. One manifestation of that questioning was the groundbreaking study The Limits to Growth which, despite what its detractors have said, made no predictions. Rather the study models resource use over time given a large range of conditions including an endowment of resources that was twice what anyone imaged they might be at the time. The troubling conclusion of the study was that nearly all scenarios led to the crash of industrial civilization at some point. The key observation in that study aligns with Bartlett's, namely that exponential growth in the consumption of finite resources is unsustainable. At some point growth in the rate of extraction will cease. And, given the dependence of the economy on continuous growth of resource inputs including energy, this leads to instability and finally decline. Let me help you envision what exponential growth means. If you receive 10 percent interest on $100, after one year, your $100 will turn into $110. In the second year, at the same interest rate, your money will turn into $121. At the end of year 50, the amount will be $11,739, a considerable sum. At the end of year 100, the amount will be $1,378,061. By year 200 your heirs will have almost $19 billion. If we dial down the rate to, say, just 2 percent, the corresponding figures are $269 for year 50, $724 for year 100 and $5,248 for year 200. Clearly, rate matters a lot! But, even so, if these numbers represented the rise in the rate of resource consumption, even at two percent after 50 years, we'd be consuming resources at 2.7 times the original rate. At 100 years it would be 7.2 times, and at 200 years, 52 times. Now money is a social invention which can be created by electronic keystrokes these days in any amount. Eons of geologic transformation and concentration are not required. But finite natural resources by definition have a limit. We cannot say with precision what that limit is, but we know it is there. The rejoinder to Bartlett and others like him is that technology will overcome any limits, and that we'll use substitutes for resources that run low. It's hard to imagine what might be a good substitute for uncontaminated, potable water; but, in the cornucopian's mind anything is possible. It's also hard to imagine a modern technical society without metals. But, we'll think of something, right? However, please don't say that that something is made out of materials derived from oil, natural gas or coal which are also finite. The problems posed by exponential growth mean we'll have to think of "something" at increasingly short intervals given the ever rising rates of consumption and the broad range of finite materials we depend on--especially fossil fuels (oil, natural gas, coal) and much of the periodic table of elements including the usual suspects such as iron, copper, aluminum, zinc, silver, platinum, and uranium and the more exotic ones such as lithium, titanium, the so-called rare earth elements, and helium. It's not just one substitute we'll have to find. And, we may be faced with having to find many all at once. The idea that technological innovation will always and everywhere stay ahead of an ever increasing rate of depletion may be true or not true. But we cannot know this ahead of time. In fact, if it were true, why hasn't technological innovation brought oil prices down to where they were in the 1990s before the run-up of the last decade? There's no commodity more central to the functioning of our economy; and, there's been huge spending by the oil industry and deployment of revolutionary new techniques. Yet, the price remains stubbornly high. The glut that was promised year after year has failed to materialize. The problem is not that technological innovation has ceased; it's that it may not be enough. And so, we are assuming huge risks by taking it on faith that all hurdles to the continuance of our technical civilization as it stands can be overcome in time and forever by technological advances. We are taking it on faith, essentially, that we will never screw up so badly that our highly-efficient, just-in-time economy will cease to grow and finally decline until it reaches a level that can be sustained by a much simpler and less technically advanced set of practices, probably for a much smaller population. It stands to reason that even the RATE of technological advancement must have a limit. Humans are not infinite in their powers of reason. Even with computers, we cannot innovate at infinite speeds. It is the rate issue that Albert Bartlett spent the last half of his life trying to bring to the fore in the minds of the public and policymakers. While many in the scientific community have now come to understand his message, the broader public and policymakers still seem largely in the dark. Rates, and particularly exponential growth, are clearly not easy to grasp; otherwise, so many more human beings would have grasped these concepts. Can you think of any problem on any scale, from microscopic to global, whose long-term solution is in any demonstrable way aided, assisted or advanced by having larger populations at the local level, the state level, the national level, or globally? So far, I can't think of any. Our energy future: "They'll think of something"
With oil prices hovering near historic highs and coal, natural gas and uranium prices yo-yoing during the last several years, concerns about the future of fossil fuel and uranium supplies often elicit the response: "They'll think of something. They always do." This kind of thinking is usually premised on the idea that the future will look like the past, only bigger and better. It does not even admit the possibility that we may need to reduce our energy use. We'll come back this issue later. The pronoun "they" in the generic quote above is vague, and the speaker does not know that he or she is actually referring to two distinct technological approaches to our energy future. Each technology progresses amid a different and highly consequential backdrop. Let me cut to the chase. Advancements in technology designed to extract more oil, natural gas, coal and uranium from the ground are in a race with geological constraints. The more of each type of fuel we extract, the more difficult it is to wrest each subsequent barrel, cubic foot, or ton from the Earth's crust. The deposits become leaner, that is, there are fewer units of what we want per ton of earth--and more refractory, that is, more challenging to process in order to separate the stuff we want from the stuff that isn't oil, natural gas, coal and uranium. The empirically established principle is that we go after the easy deposits first and save the difficult ones for later. So now, we are arriving at the difficult ones: shale gas, tight oil, tar sands and low-grade uranium deposits. Rather than debate the future supplies of each which cannot be known with any certainty, let me turn to the backdrop for what we call renewable energy. The technological progress we make in solar and wind occur against a dramatically different backdrop. The light from the sun is not becoming less and less intense over the long run forcing researchers to think of ways to capture more and more of the diminishing intensity of sunlight. Instead, even though there are cycles to the sun and cloudy days, the light from the Sun that hits the Earth is remarkably steady. In fact, over the next 5 billion years, the Sun will actually increase in brightness before starting its transformation into a red giant. Unlike researchers who experiment with methods for extracting ever more lean and refractory deposits of fossil fuels and uranium, solar energy researchers are not fighting a depleting Sun in any time frame meaningful to humans. Their task is to find ever more efficient ways to capture sunlight and turn it into heat and electricity, sunlight that is so ubiquitous and so plentiful that the equivalent of 7,000 times the current human usage of all forms of energy is absorbed by the Earth's land, oceans and atmosphere each year. With solar we are not and will never be in a race against depletion (unless the human species lasts for 5 billion years--which is unlikely since the lifespan of mammalian species averages about 1 million years, though some may persist for up to 10 million years). Wind, of course, is a derivative of solar power since it merely represents air currents which form in response to the uneven heating of the atmosphere. Given existing technology, there are, naturally, only certain places that are suitable for wind generators. But, as the technology improves, more places will be practical for the placement of wind towers and small household wind devices. I suppose it is theoretically possible to place enough wind generators on the surface of the Earth to dissipate all the winds. But we are so very far from that, that I think it will likely never become anything but a sporadic local issue far into the future. Geothermal energy has vast potential, but low efficiency given the costs of extracting it from deep in the Earth. I still see a role for geothermal, but I can't make the claim that it is as a practical matter ubiquitous or, on a local scale, inexhaustible. I ultimately see a limited role for biofuels to provide liquid fuels for emergency vehicles, rural transport and farm machinery. But, they will not actually be renewable until we stop engaging in agriculture which erodes and degrades rather than builds the soil. For now we must accept that biofuels are actually part of a mining operation--only in this case what is being mined is the fertility of the soils and the fossil fuels used to plant, fertilize, weed and protect biofuel crops from pests. Ocean thermal, tidal power and wave energy will certainly be niche players. Hydroelectric power has some new potential in developing countries where all the major rivers have yet to be dammed. Small hydroelectric still has possibilities in developed countries. But, most major rivers there have already been dammed. Keep in mind that dams eventually silt up (unless they are dredged) and cease to be sources of energy for society. So, here's the score so far. Researchers seeking to extract fossil fuels and uranium from the Earth's crust are in a race with ever more stringent geological constraints, a race they will ultimately lose. If that were not the case, we would not already be seeing declines in oil production in country after country in the last 40 years. And, we can expect that this will happen for the world at some point, not only for oil, but for natural gas, coal and uranium as well. But, as a practical matter, the physical limits of sunlight will NEVER, EVER be reached. What's more, sunlight is not becoming more difficult to access. We have the same access to it today, tomorrow and for the next 5 billion years. There are some limits to solar and wind power, however, that have nothing to do with their fuel source, sunlight. To scale solar and wind energy production large enough to produce the amount of energy we use today as a global society would take so long--even at vastly increased rates of deployment--that we will almost certainly fail to do so before fossil fuels begin their inevitable and perhaps swift decline. The other task is to transform an infrastructure dependent on liquid fuels for transportation into one which uses primarily electricity. We are slowly beginning the transition to electric vehicles. But it is at a very slow rate compared to the rate we need. And, private automobiles are almost certainly not the answer for the future. Electric trains, trolleys and buses are a better alternative. Then, there is the problem of electricity storage. We know how to store electricity, but it is very costly. We need new low-cost solutions, and many researchers are trying to find them. All these limits on renewable energy explain in part why we have not embraced it as fully as we need to, and why we still prefer fossil fuels and uranium for the lion's share of our energy needs. But it won't matter what we prefer when the rate of production of nonrenewable energy sources starts to decline. If we are not ready, we will be in a world of hurt. The only sensible response to this looming possibility is to begin reducing our energy use now in earnest. If we do that, we have a much better chance of making a successful transition to a renewable energy economy--a transition which will happen whether we like it or not. We actually know right now how to make dramatic reductions in energy use while only affecting our daily activities minimally. But, it will cost money up front (which we'll get back in the form of energy savings). And, it will require enormous political will because some of the changes will have to take place in our transportation and utility infrastructures, both of which are now largely committed to fossil fuels and nuclear power. Reductions in energy use and the rapid transformation of our infrastructure are not typically what people think about when they say, "They'll think of something. They always do." We have indeed thought of something. But that something is going to require the active participation of everyone. It isn't going to be done TO us. It will have to be done BY us. I've been watching old episodes of The West Wing, the acclaimed television series about life and work in the West Wing of the White House. In one sequence of shows, bombers kill two U.S. congressmen and a former chairman of the Joint Chiefs of Staff who are on a fact-finding mission to Gaza. Pressure mounts from both political parties in Congress, from the public and even from the president's own staff for a retaliatory military strike. But the president doesn't like his options, and he delays. Violence will just beget more violence. Is there a way to bring the bombers to justice without killing innocent civilians and entangling the United States directly in the Israeli/Palestinian conflict as a combatant rather than a broker for peace? Today, the real president of the United States has the opposite problem. He is getting pressure from many in Congress and the public NOT to make a military assault on Syria. Even the British Parliament rejected a call from Prime Minister David Cameron to join any U.S. military action in Syria. For obvious reasons, Americans are leery of involvement in yet another war in the Middle East. So, why is this president--the same one who opposed the Iraq war when he was a state senator in Illinois--drawing up plans for a military strike? The ostensible reason is the use of chemical weapons by the Syrian military. President Obama called this heinous act a violation of "international norms." But in a war that has already taken 100,000 lives would "international norms" have been better observed if Syrian soldiers had simply gunned down everyone instead? I believe that the Syrian regime's use of chemical weapons is merely a pretext for American intervention despite all the hoopla about the president's rather vaguely worded "red line" warning about chemical weapons to Syria last year. (Need I recount the simmering conflicts and resulting tragedies around the world in which the United States chose NOT to intervene?) One always suspects that oil is the real issue when it comes to the Middle East. So, let's see if that's the case here. Oil producers in Syria's neighborhood ranked against all other countries in the world as of 2012 are as follows: Saudi Arabia (2nd, behind Russia), Iran (5th), Iraq (7th), Kuwait (8th), Egypt (25th), Turkey (54th), Israel (95th), and Jordan (96th). (In the age of jet warfare I am tempted to include the United Arab Emirates (8th) and Qatar (19th).) Turkey is more important than it seems because two major oil pipelines run through the country, one originating in Azerbiajan and the other originating in Iraq, that country's largest crude oil export line. The general idea that Syria's neighbors hold the keys to a lot of oil certainly comes as little surprise to anyone with a cursory knowledge of the Middle East. But, the salient fact about the Syrian conflict is that it is a civil war. So, why is an American president so concerned about a war within the country? That question leads to a second and even more salient fact. This civil war has now become a proxy for the Shia-Sunni split in the Muslim faith. Don't think: Catholics and Protestants in the United States. Rather think: Catholics and Protestants in Northern Ireland where a wide range of nonreligious issues sparked violence between the two groups for decades. The split isn't just between countries that are predominantly Shia and predominately Sunni. 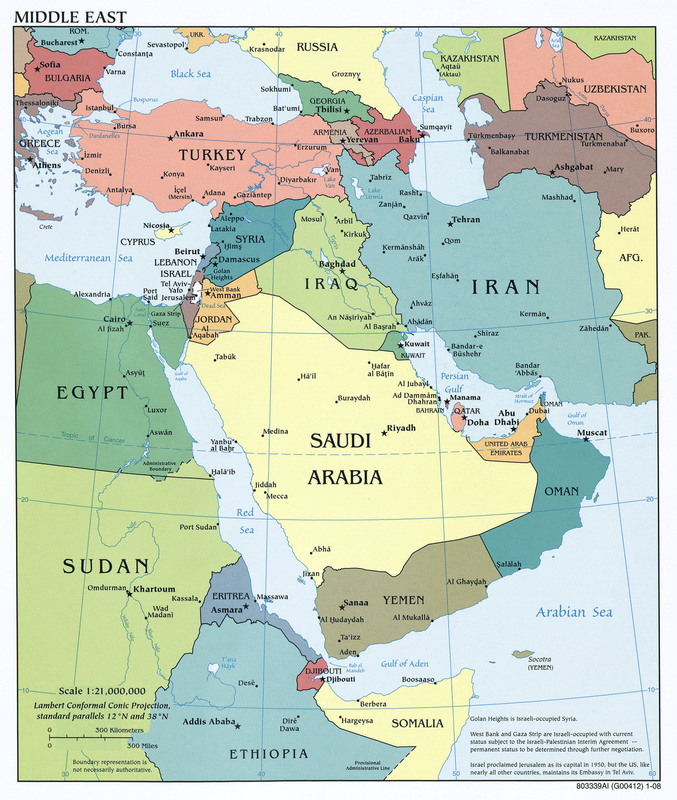 It is, as Syria is showing, a split within many Arab nations which have citizens of both sects. So, there is not only the potential for conflict between nations in the Middle East, but also for the spread of civil unrest and civil war to other nations in the region. Iraq continues to demonstrate that this fear is not just hypothetical as bombings perpetrated in the name of minority Sunnis continue to vex a country which has experienced a long civil conflict between Shia and Sunni after the U.S. invasion. The spread of that kind of chaos would be very bad for oil supplies. Witness what has happened to Syrian oil production. It has fallen from 367,100 bpd in 2010 to just 157,200 bpd as of the end of last year. That's a decline of 57 percent in two years. That kind of decline in Middle East oil production would have catastrophic effects on an already iffy world economy, one absolutely dependent on oil for its smooth functioning. The United States, as it turns out, has already been aiding the rebels for some time. The idea behind the aid may have been that the current regime might fall quickly, and the United States and its allies would have a solid relationship with those who take over. With the stalemate continuing it's not obvious what strategy will work best to achieve America's number one goal in the region: stable oil production. One think tank academic even suggested that an ongoing stalemate was in America's best interests. Clearly, he doesn't believe the Shia-Sunni split will lead to conflict between or within other countries, at least on a scale that would prove troublesome. But, there is one final consideration. After all we've been hearing about American energy independence, about growing domestic oil production, and about America being able to disengage from oil-exporting dictatorial regimes in the Middle East and elsewhere, the president seems as engaged as ever in the region. There are three reasons for this: First, right now the United States imports just under half its oil needs. We produce a little over 7 million bpd and consume about 14 million bpd. Second, no realistic nonindustry assessment of future U.S. oil production suggests we'll stop needing substantial imports. Third, oil is traded in a world market, and its price is determined by world supply and demand. Any disruption in Middle Eastern oil supplies would lead to much higher prices which would ripple through the U.S. economy no matter how much we produce domestically. The worldwide concern over Syria tells us that oil supplies remain tight and consuming nations remain very concerned about disruptions to supply. The oil price continues to hover near all-time highs when compared to the average daily price in 2011 and 2012, both record years. As the United States prepares plans for intervening militarily, there is not only much at stake in human terms, but also most assuredly in terms of critical oil supplies.